Steal an Elder Scroll for the Gray Fox, and for glory! After fencing at least 1000 gold in stolen items, the Gray Fox will contact you for a mission. 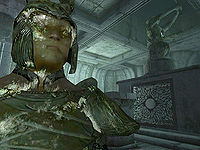 Sneak into the Imperial Palace Basement and activate the Glass of Time to enter the Imperial City's sewers. Make your way through The Old Way and The Lost Catacombs to the Hall of Epochs. Sneak through the Imperial Palace to the Elder Library. After receiving the Elder Scroll, escape from the Imperial Battlemage's Room and return to the Gray Fox. Take the ring the Gray Fox gave you to the Countess of Anvil, Millona Umbranox. After some secrets are revealed, accept the Gray Cowl of Nocturnal to become the new Thieves Guild Guildmaster and Gray Fox. Once more, Amusei summons you to see the Gray Fox. This time Amusei will send you to Othrelos' house in the Imperial City. The last three quests were a preparation for the ultimate job: retrieve an Elder Scroll from the Imperial Palace. He makes no secret that this will be a most dangerous and daring task and warns you to be prepared. He gives a detailed plan for the heist, involving going through the sewers into the Old Way (an old escape route) to reach the Elder Library, impersonating Celia Camoran to intercept the scroll, and making the getaway. He gives you an Imperial Sewer Key for access to the Palace Sewers, the restored Arrow of Extrication, and the Boots of Springheel Jak. He also tells you that there will be no blood price during this quest. The first task before you can begin your descent into the sewers is to sneak into the Palace Basement (downstairs from the Elder Council Chambers in the palace) and activate the Glass of Time (a giant hourglass). You can also complete this task without sneaking by picking the lock then making a beeline for the Glass of Time (if you are willing to incur a bounty). A third option is to just skip this step completely. Supposedly, activating the Glass of Time unlocks the Old Way, but because of a minor scripting glitch this step is actually optional. If you know where to head once you're in the sewers, you can head straight to the Palace Sewers entrance. The main trip is a lengthy dungeon crawl, so before proceeding it is worth making sure that you have everything you will need, including enough lockpicks and a bow to fire the Arrow of Extrication. Once you are ready, head into the sewer entrance from the Arboretum. Proceed through to Beneath the Bloodworks and make your way past the various undead creatures including skeletons, vampires, ghosts, and wraiths. Head into the Palace Sewers (you need the Imperial Sewer Key for this). Proceed through the two zones called the Old Way and into the Lost Catacombs. At the end of the Lost Catacombs there is a large rectangular room with a tiered upper level. On the north side of the room there's a stairway to the upper level, but there is a large gap in the stairs. Equip the Boots of Springheel Jak and you will be able to jump over the gap. On the upper level, you will find two push blocks; one on your immediate right, which will activate the two dormant Dark Welkynd Stones, and one push block on the other side of the room; activate this one in order to open the gate and access the next zone, the Hall of Epochs. Not far in, you'll come to a huge chamber with a large statue, identified as the Keyhole Pillar, flanked by two smaller statues. A quest update in your journal lets you know that this is where you need to use the Arrow of Extrication. In order to fire the arrow, you need to be standing in a specific spot to open the keyhole on the pillar. The update hints that the location needs to be somewhere with a clear view of the pillar. If you start exploring the room, another quest update will let you know when you're approaching the right area. The correct location for firing the arrow is blocked by walls and locked gates. You may attempt to simply jump the gap from the ledge behind, although it will be a challenging feat even with the Boots unless you yourself have a high level of acrobatics. The intended way for you to reach the location is to lower the walls by activating a hidden Push Block. If you head south from the main room, you'll find a Push Block on the balcony—this doesn't affect the walls in the main room, but it does open a hidden door. Continuing past the hidden door leads to a new zone (also named the Hall of Epochs). The Push Block you're looking for is at the end of this zone. Returning to the main room will reveal that the walls have dropped away (freeing some undead) and that the gates have opened. If you didn't bring along a bow, make sure to get a bow at this point: one of the four undead who were just freed is guaranteed to be an archer who carries a bow. When you stand on the pressure plate, the keyhole in the Keyhole Pillar is opened up; if you step off the plate, the keyhole closes again. Only your presence on the plate triggers the keyhole; other creatures or corpses will not be recognized. Therefore, you need to be standing on the plate when you fire the Arrow of Extrication. Careful aiming is necessary because you only have one Arrow of Extrication, and it is a long distance shot. You can practice with regular arrows; watch for the puff of dust that indicates where the arrow hits if it contacts the statue. If you miss with the Arrow of Extrication, you can also go retrieve it and try again (if you can find the arrow). In any case, you probably want to save before making an attempt. Aim at the cross formed at the hilt of the statue's sword, or possibly slightly lower, where the top of the statue's hands come together. If you listen carefully, an accurate shot produces a sound of metal on metal, even if a regular arrow is used. If a message appears saying "you cannot fire this quest arrow now" try hotkeying the arrow of extrication and then reloading a previous save. Once you've got the key into the statue, it'll lift up from the ground and reveal a door. When you are close enough, the two statues beside the door come to life as Ayleid Guardians. They provide a challenging fight, although it is much easier to simply sneak past them. If they do see you, simply running will not help: they will follow you and alert all of the guards in the palace to your presence. Once you are past the guardians, go down the stairs to the door and open it. (You might need to remove your armor to avoid waking the guards in the next room). You emerge in the Imperial Guard Quarters. Be very careful not to get caught during this part of the quest. If you are, you will not be able to go back up to the palace and are left with no way of finishing the quest. Prepare to do some serious sneaking through two doors, one of which is locked, to reach the outer round corridor (although some of the doors may already be opened by the guards). One way to make this part easier is to wait by the open statue until it is 1 am then enter while the guards are sleeping. Then go up a level to reach the Elder Scrolls Library. Sneak past the guard and enter the main core of the library. You'll see two corridors curving away on either side of you. Follow the right one first. You'll come up behind a seated Blind Moth Priest. If you're sneaking, he won't turn. Pull the lever to his back right and creep back the other way, all the way around the level. You'll now be facing the blind priest, and beside a door that the lever opened. Go inside the library and sit down in the Reading Chair—not one of the benches around the side of the room. The priests, thinking you are Celia Camoran, will bring you the Elder Scroll. Take the scroll (when unobserved) and make your escape. You may also want to take two useful Shadow scrolls from the bookcase, which each provide 50% Chameleon. You can't go back the way you came, but instead must head up the nearby stairs. Make your way through the Moth Priest's Quarters to the Imperial Battlemage's Chambers. Sneak past the guard, Evangeline Beanique. Alternatively, there is no Blood Price for killing her, but it will result in suspension from the Mages Guild if you are a member, and may alert the guards. In the fireplace, there's a chute leading somewhere. It's a long, long jump. You can use the Boots of Springheel Jak to jump safely, but they'll be destroyed by the jump (you land safely when wearing the boots because it is a scripted effect, not actually because the boots provide +50 Fortify Acrobatics; the same script then removes the boots). The fall is easily survived without the boots by having enough Acrobatics, or good health—or if you can sufficiently fortify either. It can be done with just around 40 Acrobatics if you have at least around 180 health. Don't reequip the boots without saving first because if you jump with them on while still on the quest they could be destroyed. There is a small sloped ledge just a few feet below the grate itself that can be used to briefly slow your fall. While not a great help, this ledge will save you a few health points that could ultimately be the difference between life and death. Another way to survive the fall, if you have at least 30 Acrobatics and 110 health, is to equip an item which fortifies health by at least 15 and consume two of the Surilie Wines found in the room. It is recommended that you use the Surilie Brothers Vintage 415 and Surilie Brothers Vintage 399 as you will likely have more health after the fall. Before doing this, however, you must first return to the trapdoor in the Guard Barracks where you first entered from the Hall of Epochs. Attempting to open the trapdoor will give you the same quest update that you would get from jumping down the chute in the fireplace. It is critical that you get this quest update before being arrested, otherwise you will never be able to finish the quest. No matter how you choose to do the jump, you end up back at the entrance to the Old Way. Head back through the sewers and return to the Gray Fox with the grand prize. Now the Gray Fox gives you another task: give his ring to the Countess of Anvil. He says it may cause anger or tears, and if she asks, tell her it's from a "stranger". Go to Anvil and do what he says. To show her the ring, you'll have to talk to her when she is sitting in the Great Hall. If you are there at night when she sleeps you will have to wait until morning. The Countess recognizes it as the wedding ring of her long-lost husband, who had disappeared ten years ago. At that moment, a man (a Stranger, the master forger) stands up and approaches the throne. He makes a declaration about Emer Dareloth being the one who stole the Cowl of Nocturnal, and says he's her husband and the Gray Fox. He received the cowl from the previous Guildmaster who was at the end of a line of guildmasters right back to Dareloth, each one of whom had inherited the curse along with the cowl, erasing them from history and the memories of everyone who knew them. He was the first to realize that he could use the power of the Elder Scrolls to break the curse. Having done so, he is recognized by Countess Umbranox as her husband on the condition that he renounces his life of crime. He gives you the Cowl and the title of Gray Fox and tells you that the Guild's hall has been restored due to the curse being lifted and, thus, its history having been changed. You get another entry when you hit the Imperial City. The former Gray Fox has been restored as Count of Anvil and Dareloth's home is restored as the Thieves Guild hall. The top floor is the Guildmaster's Quarters, which can be used as a home. However, the containers in the rest of the building are not safe for storage. There's a locked room with a handful of lockpicks on the table and a Security skill book upstairs but nothing more. Armand will be available upstairs when he's not outside at the Waterfront. With the grand quest over, you're free to do as you like as the new Guildmaster of the Thieves Guild. More details about the Gray Cowl of Nocturnal can be found on its page. Amusei will not seek you out and initiate the quest if you are in jail, in the Dark Brotherhood Sanctuary or wandering around in the Elven Gardens District. If your Acrobatics skill is high enough, you may be able to enter the palace without the Boots of Springheel Jak. The Speechcraft skill book 2920, Second Seed (v5) is only available during this quest. It is in the Imperial Battlemage's Quarters, on a high shelf to the right of the fireplace you jump down near the end of the quest. Without the Shivering Isles expansion pack, the book Feyfolken III is only available during this quest. It is in the library where you take the Elder Scroll, on the first shelf on the left. It is possible to reach the pressure plate by jumping rather than lowering the walls. Although an invisible wall blocks your path, it is possible to jump under it and over it to reach the plate. If the push block isn't opening the walls, you can very easily stand behind the Iron gate and then jump around it using the boots of Springheel Jak. Setting the stage to activate the statue is not a viable option, as it will active the guardians but not the secret door. If you did this, you can still use the arrow to activate the door. After you complete this quest, a special edition of the Black Horse Courier is published: Palace Break-In?. In fact, it is published immediately after the great heist, even before the quest is completed. Also, if you are caught when sneaking around the palace and cannot finish the quest, you may hear rumors that the Palace was infiltrated and that there might be a new Gray Fox. If you put the cowl on immediately and talk to the "Gray Fox", he will respond like a normal citizen. This happens until one of you leaves the cell and you get the quest update. There is an unused dialogue option "I don't want the cowl's curse" that was supposed to appear at the end of your conversation with the "Gray Fox" (after he finishes talking with Millona). He would respond to it with "The curse has been broken. Of course the thieves will only recognize you as their guildmaster when you wear the cowl. However, when you remove the cowl, eveyone [sic] will know you as yourself. Fortunately, the cowl still has the power to hide your alter ego from them. They will not realize that you are the same person that just took off the cowl. To them, the Gray Fox just vanished into thin air." However, since the preceding dialogue is marked as ending the conversation, this dialogue option never becomes available. In Skyrim, during the quest Elder Knowledge, when you ask Urag gro-Shub about the Scrolls, he asks "Do you even know what you're asking for?". Should you tell him you do and ask if he has one in the library, he will say that even if he had one there, it would be under heavy security and not even the world's greatest thief could lay a finger on it. This is an obvious reference to this quest. An achievement will be unlocked upon becoming the new Gray Fox. During the final cutscene, it is possible for your game to become permanently frozen. This occurs after the dialogue between the countess of Anvil and the Gray Fox. He says that he is going to pass on the Gray Cowl of Nocturnal to you, but then just walks away and you remain stuck in "cutscene mode" with the Countess in a sitting position facing the chair. This will occur if your guild rank at the time is not "Master Thief". The only known way to have the wrong guild rank when doing this quest is if you have completed the Thieves Guild quests out of order. If you complete any of the other Thieves Guild advancement quests after the Arrow of Extrication, your rank will be reset to a lower value. Normally it is not possible to do the quests out of order. However, if you explore the Temple of the Ancestor Moths before being assigned the related quest, Turning a Blind Eye, then the Gray Fox quests are prematurely triggered. See the temple's bugs for details. Revert to a saved game made before you finished the Arrow of Extrication quest, and complete all other Thieves guild quests that advance your rank. Finish the Arrow of Extrication last, and your Guild rank should be correct. Revert to a saved game before turning over the Elder Scroll to the Gray Fox, and instead steal the Cowl. This will not finish the quest, but at least you have the Cowl. Use the console command enableplayercontrols to break free of cutscene mode and talk to Gray Fox before he walks away during the final cutscene. Remove all Oblivion patches (see Xbox 360 patches). Resume play offline from Xbox Live, starting at a point before the cutscene with the Countess. After successful completion of the scene, reconnect to Xbox Live and the patches will be automatically reinstalled. There is no known fix that works on the PS3 other than restarting from an earlier saved game. A few problems can possibly occur when you sit in the library to receive the Elder Scroll. The most serious problem is that when you activate the chair, you do not actually sit down. This bug is usually a consequence of an animation problem triggered by the end of the Umaril the Unfeathered (part of the Knights of the Nine plug-in). This cutscene freezes at this point and you never receive the scroll. To free yourself from being stuck, BEFORE you pick up the elder scroll, go to your inventory and drop an item. This will allow you to once again move freely. It might not work the first time, but keep looking around, zooming in and out of first person, and dropping random items from your inventory and eventually your movement will be freed. This bug is fixed by the Unofficial Oblivion DLC Patches. If you have downloaded the Knights of the Nine via the Marketplace, it is possible to delete the KotN content, and reload a previous save, fixing the glitch caused by Umaril the Unfeathered. Unfortunately, that means deleting all items of KotN and such. Be careful if you use this. Upon sitting in the chair, one of the Priests runs to the bottom of the stairs and says, "I'm on to you." where you are then perpetually stuck--you can look around, but cannot get up out of the chair. This can happen if you enter into the library by way of the third floor. The fix is to enter through the second floor, where the guard is picking up the scraps of paper from the floor. Inside the inner corridor, there is a lever that you can pull by one of the blind priests to grant access to the locked door to the library. Open this door, sit in the chair, and the priest will bring you the Elder Scroll. You can advance the quest using the console. In the console, select the reading chair and type activate, then close the console and wait for the character to sit. Once in position, reopen the console and type setstage TG11Heist 85 and a Priest should come and deliver the Elder Scroll as expected. After sitting, if nobody comes right away, it may be necessary to reload an earlier save, perhaps before entering the area. The issue seems more common if you delay the sitting action, such as by looting nearby shelves, going upstairs, and so on. Thus, going straight to the chair may help. It is possible the monks will detect you when you sit down, and initiate combat. however this causes a softlock, as they will not actually kill you, forcing you to reload. Another fix was found that when sitting in the chair wait for the moth priest to be up the spiral staircase and sit in the chair and then press sneak again or the moth priest will be stuck at the bottom of the stair case staring at you. 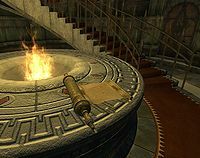 If you remain undetected by sneaking while in the chair the priest will instead walk next to you and drop the scroll on the table next to you and will regard you as Celia Camoran and you can continue the quest. If the event does not trigger, adding the Elder Scroll to your inventory will advance the quest using the console command player.additem 22DB0 1. 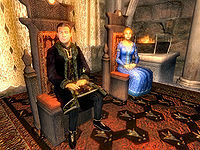 If you have been detected by the Ayleid Guardians when exiting the Hall of Epochs and do not kill them, you will be unable to sit on the chair. If you're having trouble getting Amusei to actively seek you out, it is probably because you accidentally triggered a serious bug earlier in the game. As a result, it will take Amusei forever to reach you because he is caught in sneak mode. Be patient or use the wait feature to pass the time. Eventually, he will find you and initiate the quest. If you go to the Imperial City and do something illegal, like punching a guard, you will be arrested. Pay the fine, and you will be taken to the Imperial City Prison. Amusei will spawn right on top of you. You can also initiate the Ultimate Heist using the console command setstage tg11heist 10. Activating the blue push blocks does not lower the walls and open the iron gates. Restarting the game can fix this. You may be unable to equip the Arrow of Extrication and text will appear saying you cannot fire a quest item. You can fix this by assigning the Arrow of Extrication to a hot key and equipping it that way. Walking to the keyhole pillar itself and, when prompted, activating it may allow you to now equip the arrow from the correct location. Stealing the scroll while still sitting in the chair and then being detected by the monks may cause you to become stuck in the chair and thus unable to defend yourself from the monks. This bug is fixed by version 1.3.0 of the Unofficial Oblivion Patch. The grate in the fireplace may not open, advising you that you require a key to open it. Approaching the grate will prompt a journal entry, informing you that you have escaped but you will not be able to exit the Battlemage's Chambers. To fix this, approach the fireplace and receive the journal update, then approach a guard and allow yourself to be arrested. Pay the fine and you will be transported outside the Prison District, and thus able to continue the quest. The console can also be used to open the grate; bring up the console, click on the grate, and type unlock to unlock it. Activating the Glass of Time is in fact not necessary. The associated scripting enables the door to the Old Way. However, that door is by default enabled, and therefore activating the Glass of Time has no real effect other than updating your quest diary. Several of the items in this quest remain as quest items even after the quest is complete, and therefore can never be dropped from your inventory. If you get caught after you have the Elder Scroll, the guards will chase you and you'll be stuck in combat mode—unable to fast travel, rest, or wait—even if you pay off your fines to Armand Christophe. If you are caught and attacked by more than one palace guard, the guards may all fight each other to the death (easily noticed if you cast Invisibility or use sufficiently high Chameleon that the guards lose you). This is because they have very high Aggression so that they will attack you rather than arrest you and are not actually guards but are in a special ICPalaceGuard class. However, real Palace Guards will also attend and will then attack them for attacking you. If you kill the Ayleid Guardians before they notice you, it will count as murder. NPCs may offer "rumors" about the count's return before Millona receives the ring. 10 Amusei has given me another message from the Gray Fox. I am to meet him at Othrelo's [sic] house in the Elven Gardens district in the Imperial City. 20 The Gray Fox intends to steal one of the Elder Scrolls from the Imperial Palace. The audacity of such a theft is astounding! When I am ready, I should come back to him at Othrelos house. 30 The Gray Fox intends to steal one of the Elder Scrolls from the Imperial Palace. The audacity of such a theft is astounding! The Gray Fox has laid out the plan for me. It's not simple, but he has given me a written copy for my reference. He has even set aside the guild rule of blood price for this heist. Now I just have to execute the plan. The first step is to infiltrate the Imperial Palace and activate the Glass of Time, whatever that is. 40 I have activated the Glass of Time. According to the Gray Fox, the door to the Old Way in the Imperials Sewers should now be open. Now I just have to find it. 50 I have found the sewer entrance that the Gray Fox told me to look for. Now I need to find the Old Way. 55 I have found the Old Way. This is clearly a long abandoned sub-basement of the Imperial City. It looks like it's going to be a long journey to get into the Imperial Palace this way. I need to find the door that connects to the palace interior. If I remember correctly, I will need the the [sic] Arrow Extrication to unlock time in order to open that door. 60 Advice for puzzle number three. 70 There must be some secret way to open this door. I'll bet this is where I have to use the Arrow of Extrication. Most likely I have to be standing in a special place for the keyhole to open up. It will be somewhere with a clear view of this pillar. 71 These walls look like they are meant to move. Maybe the place I need to stand to fire the arrow is behind them. I'd better look for a way to get through them. 72 This must be the spot. Standing on this pressure plate opens the pedestal at the far end of the room. I should practice with normal arrows a few times before trying the Arrow of Extrication. I will only get one try. 73 I've used the Arrow of Extrication to activate the door and open the secret way into the palace. There is no telling where I might end up. I should take care to extinguish my lights, muffle my footsteps, and be stealthy as I enter the door. 85 I've seated myself in the reading chair. Now I just have to wait for them to bring me the scroll. So long as I don't speak to any of them, the priests seem to be assuming I am Celia Camoran. 95 The Moth Priests are onto me! I have to get out of here. The way back is closed. My only hope is to go forward and hope I can find another exit. 100 I have the Elder Scroll! This is the treasure of the century. My name shall be known across Tamriel for this theft! Now to get it back to the Gray Fox. The way back is blocked. I'll have to go upstairs to find a way out. Even through [sic] they are blind, these monks will not be easy to sneak past. 102 I have escaped from the Imperial Palace by jumping down a chimney chute in Ocato's bedroom. I hope the royal battlemage won't mind my misusing his ash flue. I can only hope my fall doesn't end too abruptly. I wonder if this is what the Gray Fox said I would need the Boots of Springheel Jak for? 110 The Gray Fox has yet to pay me for stealing the Elder Scroll from the Imperial Palace. To get my reward, I have to present a ring to Millona Umbranox, the Countess of Anvil, and gauge her reaction to it. I don't understand what this has to do with the Elder Scroll, but for now I'll trust him. 140 The Gray Fox, who is no longer the Gray Fox, but is now Corvus Umbranox, has given me the Gray Cowl of Nocturnal. I am now the new Gray Fox and the new guildmaster of the Thieves Guild. Due to the magic of the cowl, the Thieves of the guild will not notice the change. However, since the curse is lifted, I can remove the cowl and be recognized as myself again. Interestingly, the cowl's magic makes it so that anyone seeing me remove the cowl does not associate me with the Gray Fox. 150 History has been rewritten. I should go see the new Thieves Guild Hall in the Imperial City Waterfront. The Gray Fox, or Count Corvus as he is now known, told me that I get to run the place. 200 Finishes quest I got into a fight with the monks. The heist is ruined. There is no way to get the Elder Scroll now. My only option is to flee the palace. I am certain the Gray Fox will expel me from the guild. I don't think they'll let me back in. It is possible to use the console to advance through the quest by entering setstage TG11Heist stage, where stage is the number of the stage you wish to complete. It is not possible to un-complete (i.e. go back) quest stages. See SetStage for more information. This page was last modified on 28 December 2018, at 00:39.